You are here: Home » Which DNS Service Should You Use? 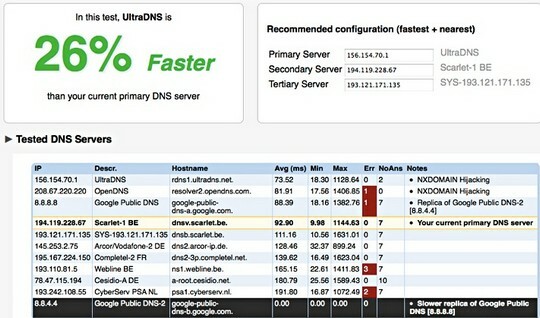 Google recently introduced Google Public DNS service. Last week, I wrote about what Google Public DNS actually means to you. If you are not aware of what it is I recommend reading that post before reading this further. With a couple of different options with DNS Servers now between your ISP’s default DNS server, the time tested OpenDNS project and the new Google Public DNS server, you might be wondering which one of these should you be using. Namebench is a free tool that’s here to answer just that question for you. It runs a bunch of tests and finds the fastest DNS server available for you. It runs a pretty exhaustive bechmarking by using your web browser history, tcpdump output or even standardized datasets to give a personalized recommendation. Namebench is a free download and works on Windows, Linux or Mac OS X. It sports both a GUI (graphical user interface) and a command line interface. It does not install anything in your computer but just runs standalone. Here is a sample Namebench result after a run. 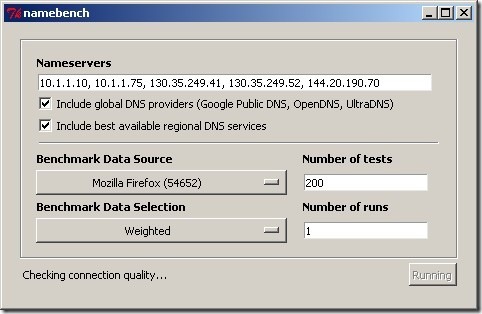 You can choose to use this DNS settings and you may be able to realize faster browsing speed. I’ve seen this before, but have always wondered something. If I choose one of these services and it changes my DNS server, if it doesn’t work out, I can change back to my ISPs configuration with no trouble? Oh and is the DNS change to all the computers on my home network? Hope you’re doing well, buddy! Great to hear from you mate! I am doing well. May be I should write a quick post on how to change this. I will write one up tomorrow and post it for Monday morning. It’s pretty simple but need to go through a few steps to do it. It’s easier with screenshots. And you can do this in one of 2 ways. If you have multiple computers, you can set this up in your router or you could set it up individually in computers. I will cover the latter as every router admin interface will be a bit different. then its easy to understand where they’re likely to proceed Burberry Online Shop.”It is also recommended to guarantee that your content is as specialized as possible Louis Vuitton Purses.It does not sound a very healthy environment to have to live Hermes Birkin.Look in the mirror try on your tight slacks and measure your waistline Louis Vuitton Outlet.Make sure you understand that much more traffic means a lot more sales and profits Chanel Purses.It does not sound a very healthy environment to have to live Chanel 2.55.the tent is removed and the house is aired using the fans again Chloe Bags.Your video clips can be clarifying thought provoking or hilarious Jimmy Choo Handbags.you can make up for it by burning a few more calories than usual in the evening Juicy Couture Handbags.So now that you’ve all of the information you need Dior Bags.